Late flowering Anemones are a fantastic way to introduce colour into the garden late in the season. Their cheery blooms will last from late August until October. All Japanese anemones appreciate a spot in sun or partial shade, they will even flower in light shade but may need some support to stop them from collapsing. A nice rich soil will help them to thrive so add plenty of organic matter as mulch in spring and when planting. Anemone hupehensis var. japonica Splendens is a wonderful selection with deeply divided leaves and two tone pink flowers. It will grow to 80cm in height so ideal middle of border. Another variety always on designer’s lists is Anemone x hybrida Honorine Jobert and its clear to see why. Pure white flowers with golden yellow stamens sit atop slender stems, a must-have to brighten a shady corner. 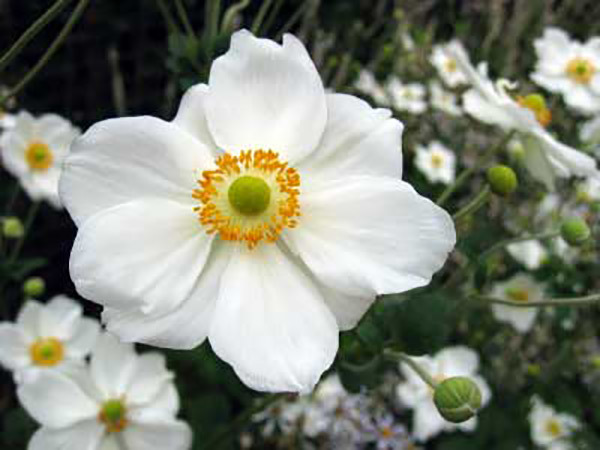 Also look out for Anemone x hybrida Lorelei with its very pale pink large flowers or Anemone x hybrida Whirlwind which has superb semi double white flowers. Previous PostBank holiday spectacularNext PostBULBS BULBS BULBS!